Scientists have learned more about ‘Oumuamua, the hunk of matter that is the first known interstellar object to ever be detected by scientists within the boundary of the solar system. Specifically, observations performed by researchers using the Spitzer Space Telescope and published in The Astronomical Journal have determined that prior observations likely established too generous an upper boundary on how large it could be. 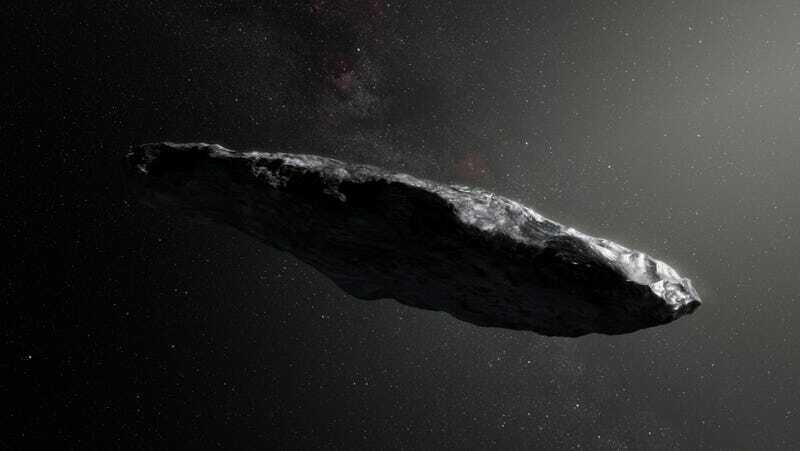 While prior observations by the University of Hawaii’s Pan-STARRS 1 telescope, NASA’s Hubble Space Telescope, and ground-based observation stations determined that ‘Oumuamua was no more than 2,600 feet (800 meters) long, NASA wrote in a statement, the Spitzer Space Telescope recently failed to see the object in the infrared spectrum over the course of a two-month survey. Based on various models of what, exactly, ‘Oumuamua is made out of and how reflective it is, that sets a new upper boundary of 1,440 feet (440 meters), and it might actually be as small as 320 feet (100 meters). Those numbers refer to the object’s “spherical dimensions,” or how large it would be if it was a sphere—though it is currently believed to be shaped like a cigar. The fact that ‘Oumuamua was too faint for Spitzer to detect sets a limit on the object’s total surface area. However, since the non-detection can’t be used to infer shape, the size limits are presented as what ‘Oumuamua’s diameter would be if it were spherical. Using three separate models that make slightly different assumptions about the object’s composition, Spitzer’s non-detection limited ‘Oumuamua’s “spherical diameter” to 1,440 feet (440 meters), 460 feet (140 meters) or perhaps as little as 320 feet (100 meters). The wide range of results stems from the assumptions about ‘Oumuamua’s composition, which influences how visible (or faint) it would appear to Spitzer were it a particular size. As Ars Technica noted, the new observations on ‘Oumuamua support the theory that it is indeed a natural object, rather than a bizarre interstellar probe scanning for data of relevance to its unknown extraterrestrial masters. Scientists have found that ‘Oumuamua appears to have slowed less than expected as it moved throughout the solar system and was affected by the sun’s gravity. That could be explained by solar radiation warming frozen gases on its surface and venting them as it tumbles through the void, a process called outgassing that could act as a de facto propulsion mechanism. This latest finding establishing a lower upper boundary on its size makes that explanation more likely, because as NASA noted, it relies on ‘Oumuamua being “relatively smaller than typical solar system comets.” The study also found that the object “may be up to 10 times more reflective than the comets that reside in our solar system,” NASA wrote, because outgassing may have swept accumulated filth off of it and revealed underlying ice and snow. According to NASA, this is probably the last that Earth scientists will ever learn about the object, because there’s no longer any way to see it.